Nothing prepares you for what’s going to happen after Kenny Dorham’s lyrical opening statements in duet with the piano of Trompeta Toccata’s title track. What follows is a buoyant Afro-Cuban gem, the opening track of one of the trumpeter’s finest recordings. Trompeta Toccata suggests Dorham played cousin to Blue Note’s front-line albums of the period like Andrew Hill’s Point Of Departure and Herbie Hancock’s My Point Of View. Dorham played on Point Of Departure alongside Richard Davis. But those albums are more dark-hued. Trompeta Toccata bears a lithe charm all its own. Like his colleagues, Dorham stretched the boundaries of hard bop, playing more freely, with a varied, more percussive style. At the same time, Dorham retained his trademark lyrical style and sweet-sour tone. The combination of the experimental Richard Davis, combative Joe Henderson, elegant Tommy Flanagan and versatile Albert Heath guarantees a lot of interesting textures. Trompeta Toccato didn’t suddenly came out of the blue. Both Dorham’s albums that preceded it, Matador (with Jackie McLean) and Una Mas broadened the horizons of the trumpeter. Dorham had cooperated with Joe Henderson as well, notably on the abovementioned Una Mas and Henderson’s dates Page One (that included the oft-covered Dorham winner Blue Bossa), Our Thing and In & Out, a title that suggests the same modus operandi as Trompeta Toccata. A key figure on a lot of Blue Note’s vanguard sessions (A series of Andrew Hill albums, Joe Henderson’s In & Out, Booker Ervin’s The Freedom Book) and the iconic Out To Lunch from Eric Dolphy) is the brilliant bassist Richard Davis. Davis’s cutting edge bass playing, including virtuoso sliding technique, is strongly featured on Trompeta Toccata. His work on the title track, advanced but firm and coherent at the same time, is a gas. The contrast between the experiments of Davis and Tommy Flanagan’s impressionistic voicings is very enjoyable. Meanwhile Dorham and Henderson are preoccupied with the melody, stressing staccato runs that start or finish with unexpected notes. Dorham’s husky edge and playful growls mix well with Joe Henderson’s virile, angular phrases. Dorham had been a premier advocate of the Carribean theme in jazz since the early fifties. The title track, consisting of a contagious 6/8 rhythm pattern, is one of his liveliest performances. Joe Henderson’s Mamacita is equally catching. It’s a more mellow, less pithy take than Henderson’s re-visit on his 1967 Milestone album The Kicker. The medium-tempo Night Watch’s elaborate structure doesn’t take anything away from its unmistakable blues feeling. Dorham sprinkles the landscape of the fast-paced The Fox with a shower of elegant, fluent lines. I like the fact that Blue Note resisted the temptation to go for a hit record by putting a more straightforward danceable track like Mamacita at the start of the album, as the label often did. (which worked out pretty swell, by the way) But for Dorham’s album, Blue Note favored the lengthy title track as the opener. It immediately states Dorham’s intentions and attributes to the album’s coherence. I’m fond of the album’s brisk, ebullient atmosphere. 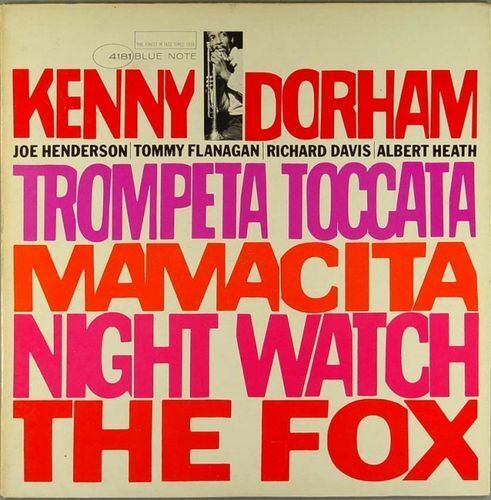 Unfortunately, it was Kenny Dorham’s last album as a leader. In hindsight, the underappreciated Dorham, ‘the uncrowned king of the trumpet’, as Art Blakey so aptly put it in his 1955 live show introductions for the original Jazz Messengers (as captured on Live At The Bohemia I & II), was ready for public acceptance. More than ready, having stood at the helm of bebop alongside Charlie Parker in the late forties and early fifties and with a batch of classic albums as Afro-Cuban and Quiet Kenny and sideman appearances on a series of outstanding hard bop recordings in his pocket. Instead, Dorham slid into obscurity and untimely passed away in 1972 due to kidney disease. But if you’re going to have a swan song, Trompeta Toccata more than qualifies.